In a recent argument with a friend, he asserted that I single out examples of left wing nonsense but don’t mention the stuff on the right. This missed my point completely. There is, of course, nonsense across the board. Pick an ideology, and you will be able to find worthy advocates of it mixed in with those that even the ideology’s adherents would like to jettison if only they could, along with a big lump in the middle that is a smorgasbord of anecdotes. My point–made with a series of illustrations–was that the left has WEAPONIZED the various institutions, picking and choosing which stories they will fixate on, with the express purpose of harming their political foes. And anyone who dissents is a foe. I gave some examples of this in my last post. There is biased reporting on the right as well as on the left, but there is this critical difference: the bias on the ‘right’ is not just transparent, but admitted. If you see something on Fox News, the Wall Street Journal, or Breitbart, you know what you’re getting. But the NYT, CNN, and the WAPO… why, they’re just reporting straight news, ya know? They’re objective folks! Not only do they cast themselves this way, but they are received by the masses this way. This naive acceptance by the American public is what makes reporting by these ‘objective’ sites prone to malicious slanting. That acceptance has dwindled over the years, and its effectiveness as a weapon weakened somewhat. If the MSM continues to do stories like the one I’m about to talk about, they will probably all go out of business. Some of us long for the day. Still, we’re talking about people who believe its their right and purpose to drive public opinion, and have no shame in using their position to do that. Nor do they have any shame in lying outright along the way. They’re called the ‘drive by’ media for a reason. One of the purposes of these folks is to characterize conservatism and Republicans as racists. They want conservatives to think there is something horribly amiss with their ideology when it can make racists feel welcome. They want the big ‘lump in the middle’ to think that the GOP has a ‘racism problem.’ Of course they will say, “Sure, sure. Not ALL Republicans are racists. But “There clearly are genuine racists on the Right.” Uh, well, there are clearly genuine racists on the left, too. There are racists across the spectrum. Is there any particular reason to think its more of a problem on the “right” than the left? That’s what the elitist libs in the various institutions (school, media, etc) want you to think, and the liberal base, already prepared to pat themselves on their own back for their own moral virtue, are happy to accept it as obvious fact, because they too can’t imagine anyone disagreeing with them unless they were bigoted somehow (because their positions are SO reasonable!). I have documented elsewhere the fact that, in point of fact, even allowing that all ‘white nationalists’ align with the ‘right’ (a spurious belief, seeing as it was the Democrat party that embraced institutionalized racism OPENLY for almost the entirety of its existence), the numbers are paltry. Richard Spencer’s National Policy Institute had just had their NATIONAL conference. Attendance? 200. TWO HUNDRED. That’s IT. Oh, by the way, take the media covering the event and the number drops to around 120… ACCORDING TO THE Southern Poverty Law Center. 120 people at a national event for white nationalists. Why yes, of course, OBVIOUSLY 60,000,000 people who voted for Trump have a ‘racism’ problem! According to the SPLC, there are only about 8,000 members of the KKK. Even accepting the fiction that they all vote Republican and all voted for Trump, we’re talking about spectacularly small numbers. So this morning, NBC’s “Today” was on, and I was greeted with a story that perfectly illustrates what I mean by weaponizing the media. Apparently, it was a rehash of an article that had already run on MSNBC. Both NBC and MSNBC are known for being total straight shooters, ya know? 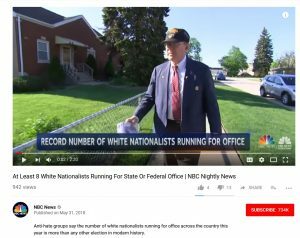 Unless someone happened to catch the split second where they reported that there were just 8 candidates, they will be left with the distinct impression: “OMG, White nationalists are increasing in number! They are emboldened by Trump! I’m not a racist! What am I to do?! ?” Or, if you are a liberal, well, that’s for a different post. That’s how it is done, friends. That’s the weaponization of the media. The total viewership of the NBC programs that broadcast this segment in some form that I’m aware of, MSNBC, NBC Nightly News, and the Today Show, are, respectively: 1 million, 8 million, and 4 million. So, almost 15 million people are estimated to have seen this segment. By the way, Fox News has a morning viewership of about 1.4 million another otherwise seems to be around 2 million a night, 3 million max. So, NBC, by itself, has 5 times the viewership of Fox News. Now add in the other two networks (nightly news numbers only, from the above link), and its ABC: 4.051M and CBS: 3.305M. Fox News taps out at around 3 million viewers. The total of all the other networks combines comes in (back of the envelop calculation) at around 50 million. Yea, so you can piss and moan about the influence of FNC and its known, transparent bias, but you are delusional if you think it outmatches the other networks, which have a viewership of more than ten times together what FNC has alone–and FNC is very much alone. That’s pretty damn good, if true. Emphasis added. In modern history? In recent history? And yet its historic? 8 is historic? And just what is meant by ‘recent’? But the question this morning is why do they feel emboldened now, why do they think this is their year to win? The message of these EIGHT candidates who are going to be completely slaughtered in their respective elections DOMINATES the 2018 Midterms! lol. Truly, these are either some of the dumbest people on the planet or among the most evil. With this kind of inflammatory rhetoric, people will inevitably get hurt. But I digress… or do I? Anyway, I’m not a tool, so I figured if they are being so careful to couch their language, the actual truth must not be as provocative. A startling number of white-power candidates are running for public office. Eve Conant reports on their under-the-radar strategy. 2012. For you in Rio Linda, that’s just 6 years ago. Here we don’t see it cast as “historic’ numbers, but just ‘growing numbers. And how many might that be? Potok’s group tracked 23 candidates in 2010 with radical right-wing views, nine of whom they described as white supremacists or white nationalists. TWENTY-THREE. Of these hundreds of millions of radical right wingers… er, sorry, 23… how many are ‘white nationalists’? Ok, so help me out here. Because all I have is a bachelors, a masters, and a PhD, I find simple arithmetic difficult. Is 9 bigger or smaller than 8? Now, this is a bit interesting, because NBC says that their source (at the 55 second mark or so) for the ‘record surge’ in white nationalist candidates–8– is the SPLC, but in 2016, the SPLC itself said that there were–9–such candidates; not a peep that this might be a ‘record’ amount. So, it just so happens that David Duke ran for election this year in the ‘deep south,’ that bastion of bigotry. Consider how horrible we must feel as a nation that as of now, a US Senator from Louisiana is a former leader in the KKK. We’ve sunk so low as a nation! Sooooooooooooooo loooooooooooooooooow. Waitasec. He didn’t win. He didn’t win?!?!?!? But with all this talk about David Duke endorsing Trump as if that meant something, I can only assume that he did exceedingly well in his election? Funny, the media told me all about Trump’s tenuous relationship with Duke (ie, its non-existent) but failed to mention that Duke not only did not win the election, but he was seventh in the list, pulling just 3% of the votes. SEVENTH. Anyway, the idea that there is a ‘surge’ or that there are ‘more’ or ‘record numbers’ or ‘historic’ is a blatant deception. This is the weaponization of the media. The whole point of the story is to demonize political opponents. Nothing more, nothing less. The NBC piece is a non-story when it comes to white nationalism. But it is a good illustration when it comes to showing what is meant by liberal media propaganda. I bet that ‘white nationalists’ have been running for political office in tiny numbers for decades, both before Trump, and before Obama. A research project for another day. Let’s deal with one last claim they made. The Today show episode says that the number of murders by white nationalists has “doubled.” Now, at least with the “surge” language, they tuck in at least SOME context, telling us we’re up to 8. However, here we get no context at all. I suppose the reader understands that if there is 1 murder in 2016 due to white nationalism but there are 2 murders in 2017 from it, the number of murders has, truly, ‘doubled.’ In a population of 300,000,000 with tens of thousands of homicides each year, I can’t imagine any reasonable person would look at a jump from 1 to 2 murders as representing a real trend that justifies mention in a national news broadcast. So just how many is it? This appears to be their source for this claim, and thankfully they provide us that context. How many murders are there in the United States each year? Oh yea. Real emboldened. If there were any doubt, this cinches it! We’ve shot up from 9 to 18. Clearly, we need to keep a close watch! Remember, the Today piece told us that the homicides ‘doubled’ and that the ‘numbers’ are rising, but provided no context to understand whether or not that was a non-trivial fact. This was intentional. If not, its pure stupidity. In either case, it should challenge you to consider your sources of information. But you’re not understanding. What if all the reasons you thought justified your concern about racism on the right were all as contrived as this? How do you know ANY of it is true? How do you know that you haven’t just been fed this stuff for decades, and because of your high view of your own concern for the ‘poor,’ you just bought it all, hook, line and sinker? What if you’ve been lied to THIS WHOLE TIME? How would you know? One thing is for sure, if you’ve bought this narrative whole sale, its no wonder that you see a racist behind every tree. Its no wonder that you cannot understand the real position of people who disagree with you, since you know that deep down that they disagree with you because THEY ARE RACISTS. There are, of course, racists. We ought to oppose them. On the other hand, the number of ACTUAL racists is quite small, unless you expand your definition significantly, and perhaps recklessly. If you keep calling people racists who are not racists, what do you think is going to happen? Incidentally, if you’ve been lied to about this, who knows what else you’ve been lied to about? Perhaps everything? We already know what happens when you’ve consistently called political opponents racists (and every other derogatory label under the sun for the sin of disagreeing) for nearly 50 years. Donald Trump gets elected president. Because people just no longer care whether it’s true or not anymore.